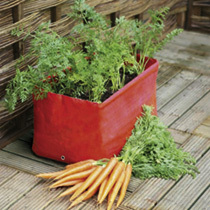 Now you can grow a bumper crop of carrots on your back doorstep! Unlike most containers, these are specially designed to be deep enough to allow roots to develop properly. Made from tough polyethylene, in an attractive orange-red carrot colour, with drainage holes to prevent waterlogging, they can be reused year after year. Complete with handy growing guide and a FREE packet of seeds of delicious and easy-to-grow carrots. Planters measure 30cm (12") x 45cm (18") x 30cm (12") high. SAVE £3.00 when buying 4 planters plus FREE seeds!